The wildcat is a popular and well known part of the Scottish natural heritage. It is the symbol of ancient clans and modern businesses, and most museums have a specimen which they claim as a wildcat. It is also a protected species. However, in a recent court case, a gamekeeper was found not guilty of shooting 3 cats because an expert witness could not say beyond reasonable doubt that the animals were indeed 'wildcats'. There have been at least 1000 years of interbreeding between domestic cats and native wildcats, and it is no longer clear whether or not there is such a creature as a pure wildcat. In order to clarify the law, and to provide protection to hybrids if this was considered neccessary, Scottish Natural Heritage, the government body with responsibility for protection of the environment in Scotland, undertook a project to attempt to identify the distinguishing features of wildcats and their habitats. The aim was to establish whether or not wildcats still existed, and if so how they could be identified. Failing this, if hybrids could be identified and they could be shown to have a habitat distinct from feral cats, these cats could be protected in appropriate parts of the country. The project involved collecting data on around 500 wild-living cats from the highlands of Scotland. These were mostly either road casualties or cats shot by gamekeepers, although there were also trapped cats and museum specimens. Data was collected on their morphology and pelage, and also on the environment in which they were found. Multivariate analysis of the morphology data identified a fairly distinct group of large cats, and analysis of the pelage characteristics showed this group to have significantly more of those characteristics traditionally associated with wildcats. This analysis does not provide evidence for a distinct group of pure wildcats, but does show that there is a substantial population of hybrid cats with most of the traditional wildcat features. Analysis of the environmental data for the areas in which the cats were found showed significant differences in the habitats of the wildcats and feral cats, with wildcats more likely in high moorland, rather than agricultural land. In 1995 M Daniels & D Balharry published a paper on 'Wild Living cats in Scotland' which can be obtained from Scottish Natural Heritage for £5.00. Interbreeding between 'wildcats' and their domesticated form in Scotland has been possible since Roman times (c.2,000 years ago). 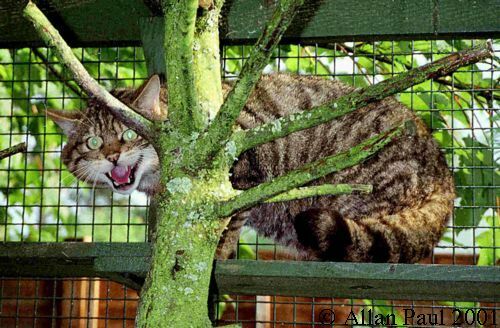 However the 'type specimen' for the Scottish 'wildcat' Felis silvestris grampia, (used as a benchmark with which to compare and identify putative contemporary 'wildcats') was not collected until 1907. The 'type specimen' approach in the case of the 'wildcat' has been particularly restrictive in reflecting any natural variation within the population. To measure the variation found within contemporary wild living cat populations, samples were collected from over 330 wild living cats in Scotland. This project investigated, directly and by external contracts and collaboration, the following characteristics using both traditional and new methods of analyses: pelage; morphology; genetics; and physiology. Skeletal and intestine measurements on a sub-sample of 53 adult cats for which maximum data were available suggested a bimodal distribution. One of the two groups so identified exhibited a degree of geographical separation and a higher ratio of 'tabby' to other coat colours. This group (group 1) differed significantly in some characters from cats which exhibit characteristics normally associated with the domestic form and is therefore a contender for the label 'wildcat'. There was a significant relationship between environmental variables and the distribution of the newly defined group 1 cats. The most important primary variables were temperature and rainfall, with this group of cats more likely to be found in colder, drier areas. Neither the analysis of skulls or pelage characteristics produced a set of characters from which meaningful groups of cats could be determined. Pelage, and therefore visual assessment of what constitutes a 'wildcat', is discounted as a suitable vehicle for distinguishing 'wildcats'.